A visual demonstration of 3 different foot strike patterns. Lets test some of what you have learned here at The Gait Guys over the last few months. The left leg appears to have all joints stacked at this viewer angle (knee is vertically over the foot, hip is over the knee). What we love here is that the foot profile (look at the black sole of the shoe) is parallel to the ground, it is hard to believe that it won’t strike as such. The medial and lateral aspects of the foot should strike flush and simultaneously. This is a neutral foot and is very likely without valgus or varus forefoot typing. The tibia looks pristine and straight without any torsion, at least from this limited perspective. He also looks to be striding nicely, it seems to appear (albeit this is reaching from this head on view) that the foot will strike below the body mass, this may be because he subtly appears to be leaning forward, again hard to see on this view. 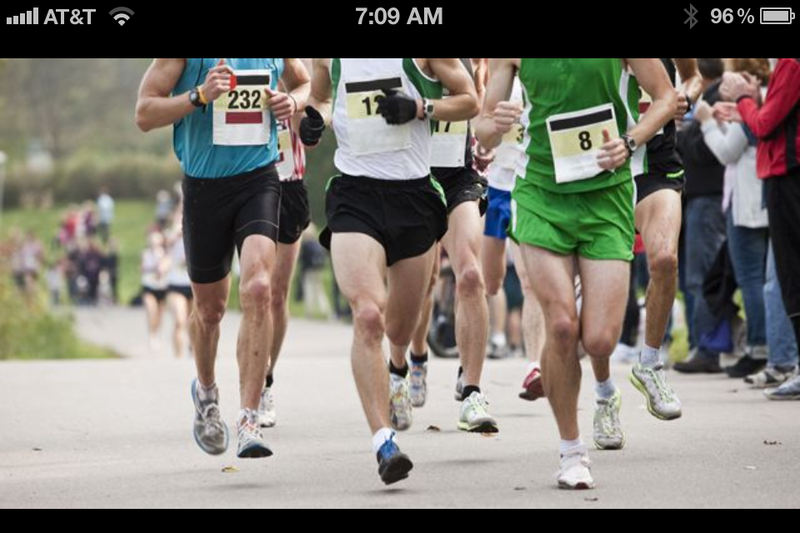 Middle runner, white shirt: We see some problems here. First of all, it appears (and again, this is reaching from a front on view) that this runner is striding out with the foot beyond the body mass and will likely heel strike, he also seems to be in more backward lean that the Blue Bib Man but again hard to tell on a frontal view. We also see that the foot is pitched in inversion (note the outward tip of his foot compared to the man in Blue) quite aggressively which will facilitate a strong excessive lateral heel and/or forefoot strike pattern. You can also see that drawing a line through the length of the long bones (tibia and femur) that they are in alignment, they are even in alignment with the 90 degree perpendicular to the forefoot inverted angulation. This clearly represents our classic “cross over gait” which was first brought to you and the internet by yours truly a few years ago (here on Youtube link). It is easy to see that the projected foot landing will be on a virtual line and thus appear to run on a line or even cross the feet over the line indicating that this client is not stacking the foot, knee and hips vertically and thus challenging the gluteus medius and hip stability into the frontal plane (video link here). This client will be wasting energy and efficiency in the frontal plane (side to side movement) and challenging the core, risking knee tracking issues and excessive foot pronation forces beyond the safe and normal. Running on the readers right, green shirt #8: There appears to be a strong stance phase leg collapse, the hip is lateral to the foot and the knee is perhaps on its way to medial from a vertical line from the foot. This can be, and often is, from the issues of cross over described in the middle runner above but it can also be simply found in someone who is striking with the foot/knee/hip joints stacked but does not have sufficient gluteus medius strength to keep the pelvis level on the horizon (thus drift laterally). When this happens the downward collapse of the opposite side pelvis is often, but not always, see as a valgus collapse at the knee since the femur is allowed to drift medially from insufficient strength, skill or endurance pairing of the gluteus medius/maximus pairing and the medial quadriceps. This client is likely a cross over victim as well and this would give good reason to the aforementioned. Again, this is all theoretical from a static picture but knowing these patterns like we do, we know these typical patterns of breakdown. This is also suspect because of the foot more positioned under the midline of the body instead of under the knee and hip vertically stacked and the obvious proximity of the knees to one another. These clients often kick or brush the foot or shoe against the stance phase lower leg as they swing the foot through. Who is going to win this race ? One cannot tell. But if they were the same on all levels of endurance, training, VO2 max and equal on every parameter except what was mentioned above, well then our man in Blue, # 232 would be the most efficient and likely the least injured. Photo from an Outside Magazine article. We Would reference it, and would be happy to do so, but we cannot find the net article anywhere now. Please send it our way if you happen across it ! Shawn and Ivo, The Gait Guys … . followed in 51 countries and counting.